An acquaintance of mine is going through a tough time. By all accounts, she’s doing the right thing by reaching out to her friends, by asking for their companionship while she breaks down. Still, when I heard from a mutual friend about the companionship this acquaintance has, I felt jealous. I didn’t have anyone to come over and take care of me, you see? I had people that I could call on the phone, which I wrote about in this post, but the phone is all I had. I divorced Caleb and moved to Ohio the next day. I started my PhD program the week after that. That time period was awful. So awful. I was alone and scared. I had no one to sit there with me while I fell apart. So I didn’t fall apart. I took Reed to the bus stop every morning. I went to my graduate classes. I taught my own classes. I wrote essays. I called my best friends nearly every day, and sometimes, I fell apart to them on the phone, but for the most part, I kept it together. A professor in my department recently wrote me a letter of recommendation. He was my professor during that first semester. To prepare for writing the letter, he asked me if I could send him the link to my essay that appeared in Best American Essays, which I did. The next day, I ran into him at the gym. He looked at me, and I realized that he hadn’t known. He hadn’t known the entirety of my story. I told him, “I’m sorry. I should have warned you.” He nodded, and I felt the same guilt that I always feel when someone I know has read my writing about abuse. I felt the burden of giving him that kind of access to my pain. I spend a lot of time in my daily life trying to protect people from my pain. My pain mostly comes out at night. It mostly comes out when I’m alone. I saw some old friends recently, and they both told me that, when they read that essay, they sobbed. And oh God, I was so sorry. I am so sorry. I am so sorry for causing pain to the people who care about me. I don’t know what else to do. I don’t know how to pretend the pain isn’t there. I spent too many years pretending the pain wasn’t there. The abuse both broke me and made me stronger. I could take a punch, then teach a class. I learned how to put on a happy face. I learned how to ice my eyes after I’d been crying. I learned how to keep from pushing my sleeves up and revealing the bruises. I learned how to sleep next to the man who assaulted me. I learned how to explain away the inexplicable. And those lessons were toxic to my inside. There were so many prices. The lessons ate away at my self-esteem. The lessons ate away at my emotional health. The lessons ate away at my world view. The lessons ate away at my relationships. I recently called out Sarah Palin for blaming her son’s abusive behavior on PTSD. I discussed how abusive behavior is a choice, regardless of whether someone has PTSD. What I didn’t discuss in detail is that domestic violence victims, like veterans, get PTSD. We live in a war zone, but the war zone is our home, and the enemy is also our lover and protector. My own PTSD started before I actually left the relationship. I still remember the first time I became aware of it. Caleb and I had a friend over. He was excited about something. He slapped his hand down on the counter, and the noise startled me into sudden shakes. They were the kind of shakes that came from the inside and radiated outwards. I don’t know how to explain how those shakes feel. I haven’t experienced them in a long time, thank goodness. The first time I shook like that was when Caleb unscrewed the heavy iron bed knobs from our bed frame and threw them at the wall above me. I put a pillow over my head to try and protect myself from the impact, and I shook. I already knew by then that being hit by an object does more damage than being hit by a fist. Being hit by a fist causes a bruise, maybe a divot, but being hit by an object does the opposite; it cause the body to push outwards, to swell, to grow, to pulse. Caleb had played baseball; he had good aim. His aim gave me PTSD. Caleb gave me so much. I would like to give it back, but I can’t. It’s all mine now. Today, I gave Reed this little quiz that’s been going around on Facebook. It’s supposed to be a funny quiz. I asked Reed, “What makes me happy?” And he answered,”Eating.” And we both laughed. And there was nothing funny about that. But, as sad as this post might seem, here’s the thing: I did get something from the lessons Caleb gave me. I learned that I could take a punch, then teach a class. And that’s something, you know? That’s actually something. Because if I could do that, I can do anything. I have never in my life thought that I was a strong person until now. I have always been very sensitive, fiery for sure, but ultimately, extremely tender. But I am no longer afraid. I know that, no matter what comes along, I can handle it. I have a project that I’m working on, and it’s going to require me to go to some dark places in the next year, but I’ll be fine. I’ve already seen the darkness. I’m prepared. I had a dream the other night. I dreamed that I was in a war-torn country, and I was trying to escape. I came upon a large lake, and I saw Caleb walking into it. He walked into it and disappeared into the deep water, so I took a deep breath, and I walked into the water too. And I could breathe under that water. I walked and found a cave. I went into the cave and came out the other side. But then, there was a tunnel, and Caleb was in the tunnel, and he said, “Follow me.” I looked at that tunnel, and I knew there wasn’t room for both of us in it, so I shook my head, no. There was a time when I would have followed Caleb anywhere. No more. When I woke up, my heart was racing, and that fear was a familiar and uncomfortable feeling, but it was also accompanied by a sense of relief because I used to wake up with that fear every morning. No more. I rarely have symptoms of PTSD now. And I rarely feel the need to fall apart. And now, I’m kind of grateful that I learned how to keep putting one foot in front of the other without falling apart. I’m grateful that I didn’t fall apart. When I look at all that I have accomplished, I know I couldn’t have accomplished it if I was falling apart. Instead of falling apart, I put myself back together. On my flight home from Idaho, I spoke with the woman next to me. Like me, she had taken some big risks in changing her life. We discussed the courage it takes to make those changes. I told her that I think it takes faith, but not faith that everything will be okay because there is really no way to know if everything is going to be okay. The faith has to be that, even if everything isn’t okay, we will still be okay. 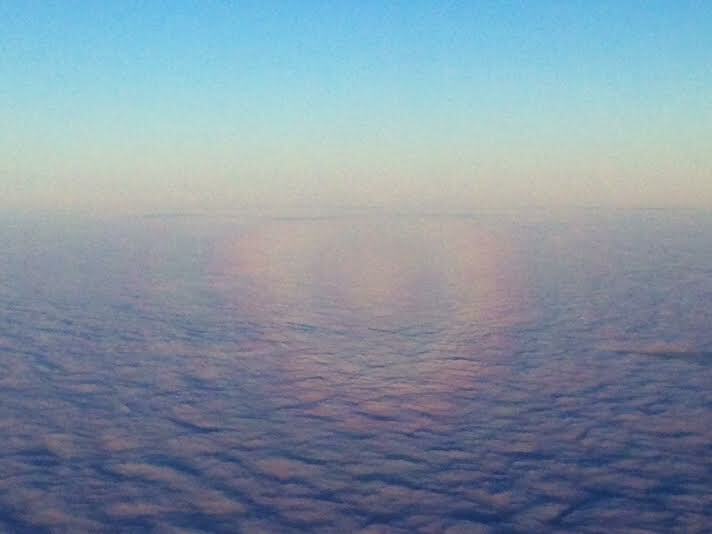 After our discussion, I looked out the window of the plane, and I saw a rainbow in the clouds. I couldn’t capture it in my photo, but the shadow of the plane made it look as though we were flying right in the middle of that rainbow. I like to think that we were.